Hi my name is Ian 'aka' Rafman Anglesey and Gwynedd. I detect mainly with my very good friend Neil "aka' Coin-meister North Wales. He purchased the Coiltek 10"x5" CTX coil and his finds success quadrupled. We have done some fields that many times it was a good chance there was nothing else to find, but that's a common mistake. A field is probably never done, you just need to alter the method of detection. On seeing his success, I quickly put hints to my wife on what I wanted for Christmas. Anyway, Neil and I went out detecting on our weekend off and I found nothing with my 11" stock coil. 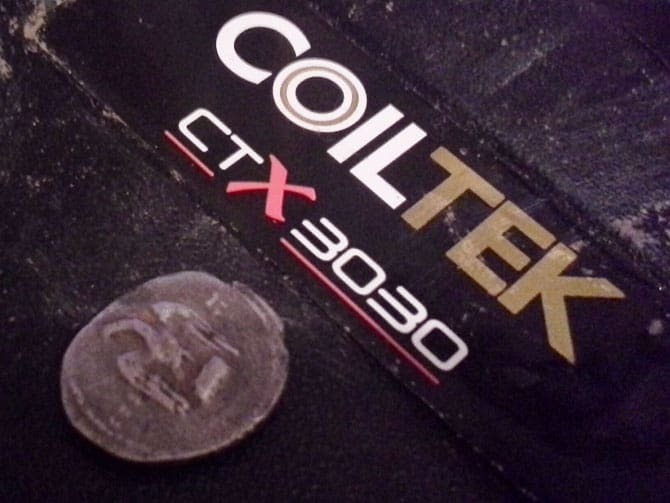 Neil was using the Coiltek 10"x5" CTX coil and had found several small relics and a lovely King George 111 bull head sixpence. Totally shocked and desperately wanting my new Coiltek. The target separation is superb with a very sensitive coil. My thoughts all were on the coil. Hopefully the wife took the hint and that Santa would deliver. Christmas day finally arrived and thanks to my wife she had bought me the coil. I got to say she made my Christmas complete. Now to find a good time to go detecting without looking ungrateful. Road trip! It was Christmas 2017 full of food and feeling like I could pop at any time. I was so pleased to be invited to Staffordshire, England for a day’s of metal detecting. Perfect I thought and an opportunity to try my new Coiltek 10x5" CTX coil. The day started slow with only a few Victorian coins and a medieval lead token. Anyway I kept going, finding myself in a very iron infested area. Everyone else could not get passed the iron. I carried on for a while coil grunting. A short time afterwards I could hear the iron but also a tiny high pitch signal. On digging and pinpointing at an incredible 9 inches, I located a silver coin. Running down the field with it clenched in my hand not knowing what it was, passing it to my friend so I could film. Cleaning off the soil to reveal a roman silver denarius of Vespasian. 68AD-78AD. The day was complete thanks to using the Coiltek. I LOVE IT. 👍😉 ...and breaking news apparently Santa does not exist in North Wales. Too wet.